Always wanted a table tennis table for your porch or garage? The STIGA Coronado Outdoor Table Tennis Table features an aluminum composite top that won’t warp or rust when exposed to the elements and offers excellent playability. Enjoy table tennis indoors or outdoors with the STIGA Coronado. Enjoy easy mobility and compact storage with the 54" Mini Pong table tennis table. 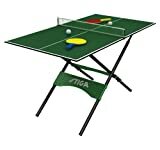 The Edge Table Tennis Table from Stiga features a 1/2-Inch Play surface with 1-Inch -InchU-Inch style legs and a chassis with support panel. The 2-Inch double wheel casters allow you to move the table with ease to your favorite location. If you want a solo workout, just put the Edge in the playback position and practice away. When finished playing, simply fold up to it's storage position and move it where you want. This table comes with a 66-Inch net & post. 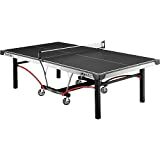 The Stiga STS410Q table tennis table offers easy set-up and enhanced play features. This table was engineered with our own patented Quickplay design with no tools required and assembly in 3 minutes or less. You can enjoy all the fun Stiga has to offer in table tennis with virtually no work. Playback and storage positions on 4" silver mag ball-bearing wheels can be utilized with easy mobility. Includes tournament grade net and posts for performance play.